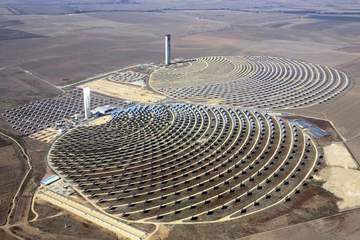 - Ouarzazate Solar Power Station is the world's largest concentrated solar power plant. Ouarzazate hosts the world's newest and largest solar power plant. Yet, this case of land grabbing challenges us to remain critical of the claim that any move toward renewable energy, regardless of how it is carried out, is to be welcomed. In order to break its heavy dependence on hydrocarbon imports, Morocco engaged in an ambitious renewable energy plan. The Ouarzazate Solar Power Station, was launched by the king in February 2016. For the benefit of the Moroccan state, the land on which the Ourzazate solar plant was built was sold by the Makhzen (dividing lines are often blurred between the state and the royal family’s holdings) to MASEN, the Moroccan Agency for Solar Energy, a private company created with public funds. Morocco’s ambitious solar megaproject has been praised by mainstream media, which touted its “green credentials” and “its potential to end Morocco’s dependency on energy imports, provide electricity to more than a million Moroccans, and export to Europe”. Despite it being praised by most media outlets in Morocco and the West, there is room for concern. The project involves the acquisition of 3000 hectares of communally owned land to produce energy, some of which will be exported to Europe. Many have called the project a form of “green grabbing” of both land and water. Hamza Hamouchene defines Green grabbing quoting (Fairhead 2012) as “the appropriation of land and resources for purportedly environmental ends. It implies the transfer of ownership, use rights and control over resources that were once publicly or privately owned – or not even subject to ownership – from the poor into the hands of the powerful” . This was facilitated by the labelling of lands of the rural south as “marginal” and “underutilized” and therefore available for investment (1 dirham/sqm, instead of usual 10-12 dirham/sqm) . A local inhabitant exclaimed: "the project people talk about is as a desert that is not used, but to the people here it is not desert, it is a pasture. It is their territory and their future is in the land. When you take my land, you take my oxygen." . The money from the land sale was deposited into a tribe’s account at the Ministry of Interior and the money used to finance development projects for the whole area. In other words, it was a transfer of funds from one government agency to another. 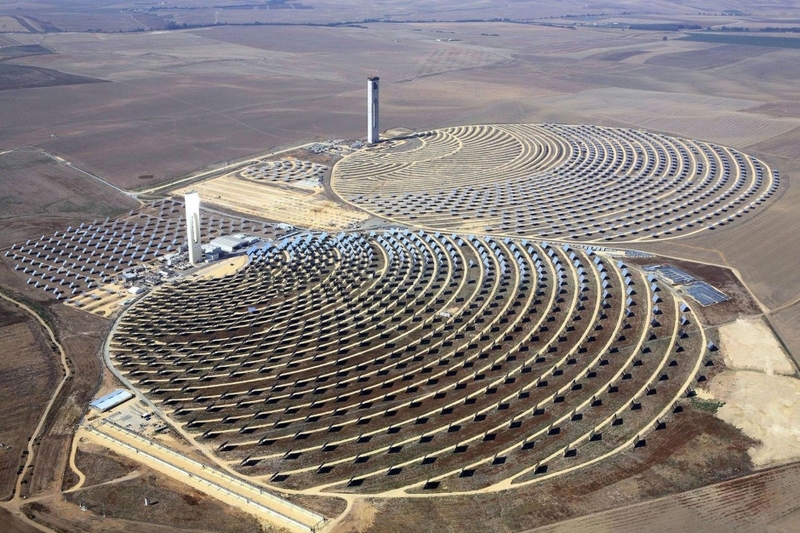 Further, the technology chosen for the solar plant is the concentrated thermal solar power often criticized for its extensive use of water as opposed to photovoltaic due to the need for continuous cooling. the plant is already using the water from a nearby dam called Al Mansour Addahabi. The water inputs to the dam vary between fifty-four and 1300 million cubed meters, with an average of 384 million cubed meters. This water is usually used for irrigation (180 million m3/year) and drinking water (four million m3/year) . By 2020, it is expected that Noor will consume 2.5 to 3 million m3 of water per year. In 2011, at the same time as the Arab Uprisings, movements for radical change started to mobilize around long-standing grievances about land, water, and the rights to benefit from economically profitable projects, such as the solar one and the mines that dotted the south of the country and resisted in various ways (complaints, sit-ins, letters...). What is happening in Ouarzazate challenges us to remain critical of the claim that any move toward renewable energy, regardless of how it is carried out, is to be welcomed. Project Details The plant is a parabolic trough type with 3-hour storage and a wet cooling system (using up to 2 - 3 million m3 of water per year). It is planned to produce between 125 to 160 MW. Noor 2 is being built as the second part of the Ouarzazate Solar Power Station. It will be a 200 MW concentrated solar power project using parabolic troughs, with a dry cooling system and 5-hour energy storage. Noor 3 is being built as the third part of the Ouarzazate Solar Power Station. It will be a 150 MW CSP solar project using a solar tower and 5-hour energy storage. Noor 4 will be a 80 MW photovoltaic solar plant. Company Names or State Enterprises ACWA Power International from Saudi Arabia - Saudi Arabian company and private partner to the Noor-Ouarzazate complex, is responsible for building the infrastructure, producing energy, and selling it to the Office National de l’Électricité (ONE), and the agreement entails an engagement from the latter to purchase the electricity for a period of twenty to thirty years. International and Financial Institutions The World Bank (WB) from United States of America - Invested USD 400,000,000 in the solar plant, as part of a major funding program in Morocco that covers areas connected to the development of Morocco’s “green” capitalism, and its disbursement reached record levels in 2011 and 2012, with a major emphasis of these loans placed on promoting the use of Public Private Partnerships (PPPs) within key sectors. Development of Alternatives What is happening in Ouarzazate challenges us to remain critical of the claim that any move toward renewable energy, regardless of how it is carried out, is to be welcomed. Why? Explain briefly. The project is in expansion. While the building of the second phase Noor II has been postponed, it is not clear why. Hamza Hamouchene (2016). The Ouarzazate Solar Plant in Morocco: Triumphal 'Green' Capitalism and the Privatization of Nature. Jadaliyya. 23 March 2016. Karen Rignall (2012). Theorizing Sovereignty in Empty Land: the Land Tenure Implications of Concentrated Solar Power in pre-Saharan Morocco. Land Deal Politics Initiative.